Enjoy premium, high-speed power at a fraction of the cost. The sleek and sophisticated Cosori C900-PRO Professional Blender employs 1400 watts of power and blends foods at an impressive 25,000 rotations per minute. Vitamin and nutrient extraction are easy tasks, whether you need ice and seeds crushed by the specialized blades, or you prefer a smooth shake or juice from finely puréed fruits and vegetables. 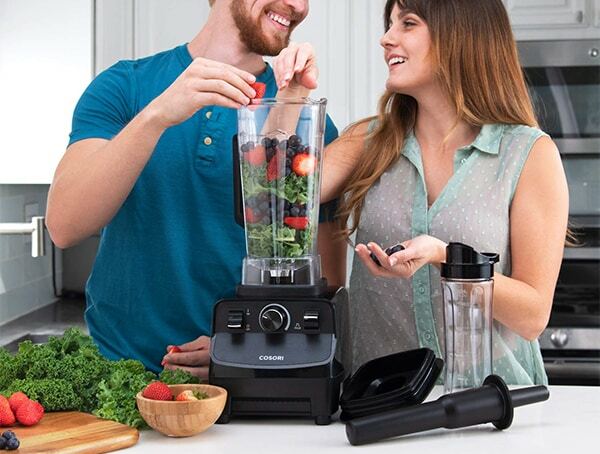 Though it’s professional-grade and heavy-duty, the blender is fantastic for any household or personal use. • Full Essentials & Quick Clean Up – 60oz BPA free pitcher and 20 oz personal travel bottle (with to-go lids), recipe book included. Blend warm water and dish soap, then rinse. All accessories are dishwasher-safe for extra convenience.